What Does a Bigfoot Eat? 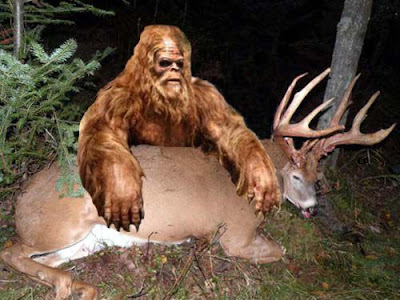 Steve's Big Squatch Theories and Opinions is back with another great discussion on the Big Fella. This week Steve is focusing on the diet of a Bigfoot. He also delves into the migration theory. What do you think Bigfoot eats? Do you agree with Steve in that they are opportunistic? And I'm also curious if anyone thinks that Sasquatch migrate? Feel free to comment below. They would eat anything that a normal meat eater would with the addition to any edible plants. Of course that's counting bugs and of creepy crawlies they might fined. Heck they might enjoy a Big-Mac if they found one. I do tend to agree with your outlook of migration. I'm in the Colo. Rockies and do believe they move with the herds. Here that being elk. The deer don't tend to move as much. I have found more signs lower in winter and higher in summer. I actually move my areas of study as the seasons change and have seen a drop in sign high as the weather shifts.